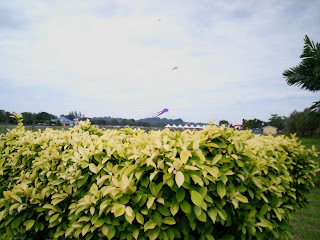 Seen recently is this huge purple kite being flown over the Bintulu old airport site. This site has been used for many years now for the Bintulu International Kite Festival due to its expanse, ample parking and generous visitor -friendly facilities. This old airport site is also located right smack in the middle of the town. Kite fliers come to Bintulu from four corners of the globe to meet here annually.